GFX Generators – The main engine for this was upgraded a lot since the last update. The picture style options have been upgraded so much that a lot of separate picture styles that were almost the same (like the various 160×196 box/art/poster tributes)are now in one choice slot on the first menu. The engine is getting close to what I’d call version 1.00 but I still have many small things to iron out. Let’s get to the content. New chars: Andy Bogard, Billy Kane, Blue Mary, Duke Edwards, Fio, Genjuro, Marco, “(more) Metal Slug characters,” Leona, Maxima, Rocky, Robert Garcia, Sie Kensou for SNK. 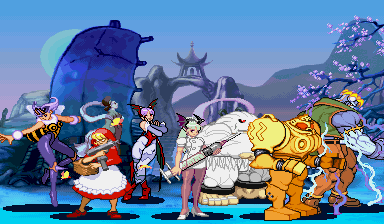 Anakaris, Baby Bonnie Hood/Bulleta, Firebrand, Huitzel/Phobos, Lilith, Rikuo/Aulbath, Q-Bee, Sasquatch, Victor for Capcom. Metroid for Nintendo. Elevator Action spy for Taito. 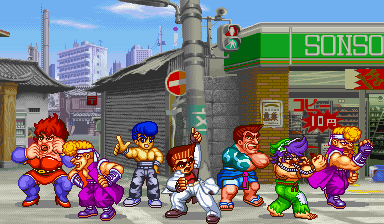 Riki, Sabu (Super Dodge Ball sprites) and Nekketsu/Kunio-Kun enemies (Shinji, Kenji and Misuzi in one character slot) for Technos. Black Lightning for DC Comics. 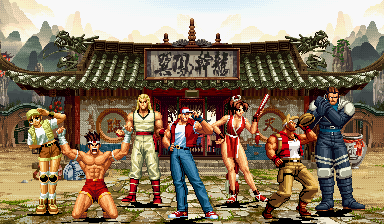 Athena, Clark, Joe Higashi, King, Geese Howard, Haohmaru, Mai, Nakoruru, Ralf, Ryo, Terry Bogard for SNK, Andore, Balrog, Dan, Demitri, Chun-Li, Guile, Ken, M.Bison, Poison, Ryu, Sagat, Vega and Zero for Capcom. Billy & Jimmy Lee for Technos. 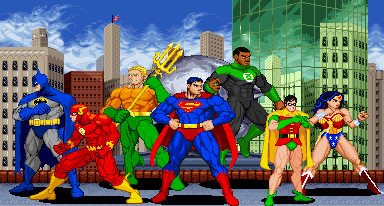 DC Comics: Scratch-made sprites of Black Lightning (90’s) and Robin (classic) and a new edit of Aquaman. PrimeOp: A new gallery with most of the scratch-made sprites I’ve created that aren’t completely embarrassing. The site will update now semi-regularly but updates will be a bit light for a while. I have commission work to finish and another website to “start” **looks shifty** but I’ll have enough updates to keep you from thinking that this place is dead. You wouldn’t believe all of the things I didn’t get finished for this update. Elevator Action Deluxe will be adding four DLC characters FOR FREE starting this week. First up? SAYO-CHAN from Kiki Kaikai/Pocky & Rocky! Hit up the official site to see who else will be joining in on the fun. Anyone who likes to use create-a-character formulas to bring their favorite characters into other games should visit GameLabor, a new website with formulas for Mortal Kombat Armageddon, Soul Calibur III & Soul Calibur IV. There’s even a YouTube channel so you can see the creations in action. Thursday’s update: Custom sprites (including two monster/horror themed sprites) and the GIANT GFX Generator update. Be ready! I was going to make one big update with all of the new content and fixes but I decided to start early and test things out bit-by-bit. The main menu layout mutated a bit (including the return of the Random Screenshots) and will probably have a few more shifts in future updates. Work on the new content got out of hand and I forgot to keep track of a few new things. 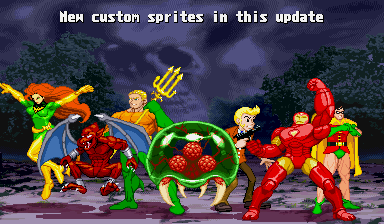 This update is basically everything except the custom sprites and graphic generators. Sprites – Hachoo! (new page with a few sprites and animations), Ninja Baseball Bat Man (new page). The Streets of Rage 2 page was updated with walking animations of the heroes. Game Index – The new main page leads to lists based on the first letter of the game and its release year. New games: Hachoo (arcade), Jungle Hunt (arcade), Metroid (NES) and Ninja Baseball Bat Man (arcade) added. E-Swat (Arcade) added to the main list after being left off the main list by mistake. ToyBoss – Stafani Rolento sent some brand new pictures of her custom 12-inch Rolento figure! Links – added links that I forgot to keep track of. One that I remembered to list is the very cool Retro Revival X. I also added Brawler’s Ave (not to be confused with the “Brawlstreet USA” banners) has been added to the Quick Links section. I really need to set up a true affiliates list. Brawler’s Ave is under reconstruction right now but be sure to check out the links on their landing page for a hint of what they’re all about! I’ll see you later this week with more treats!